With the UK already refusing to return $1.2 billion on Venezuelan gold, the nations of Western Europe have just taken the next step toward ousting the Maduro regime: Four European governments - France, Germany, Spain and the UK - warned on Saturday that they would recognize Juan Guaido (the head of the Venezuelan assembly who earlier this week declared himself the country's acting ruler until elections can be held) as Venezuela’s legitimate leader unless a date for new elections is called within eight days. To be sure, the US and nearly two dozen other countries (including most of Latin America) has already taken this step. But the latest round of warnings came as the UN Security Council met on Saturday to discuss the situation in Venezuela, where Maduro's regime is facing down the biggest threat to its rule since the socialist heir to Hugo Chavez first ascended to the presidency in 2013. However, Russia and China - both of which are permanent members of the security council - have insisted that the West back off and refrain from intervening in Venezuelan affairs. A group of Kremlin-linked mercenaries have reportedly been dispatched to provide "security" for Maduro, according to the Washington Post. European governments are citing Venezuelan's election last year, where Maduro was elected to another six year term, as the reason for ratcheting up the pressure. 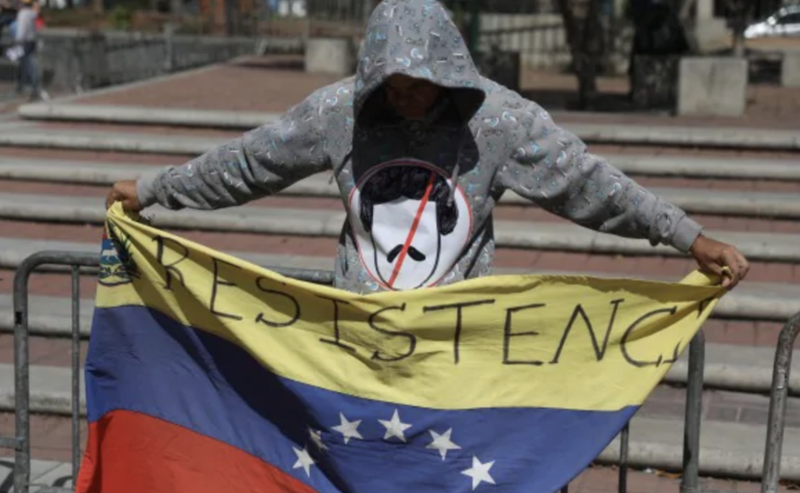 They claim the Maduro regime's crackdown on dissenting, including banning opposition candidates, as well as other irregularities, has placed the results in question. Jeremy Hunt, Britain’s foreign minister, said as much in a tweet on Saturday. Meanwhile, US diplomats are hunkering down in the US embassy in Caracas to await the Maduro regime's next move. The US has chosen to defy an order by Maduro for all US diplomats to leave the country. The US has argued that, since it no longer recognizes Maduro as the legitimate ruler, he doesn't have the legal authority to expel the diplomats. The embassy has been stocking up on basic supplies like food and toiletries. While all "non-essential" embassy personnel have been ordered to leave, Secretary of State Mike Pompeo said he expects Venezuela won't viol;ate the rights of the US. "It is literally a 24/7 moment-by-moment exercise to evaluate risk to the people who work for me in the State Department," he said. "And we’ll get this right." After offering $20 million in humanitarian aide to the opposition, Pompeo has appointed Elliott Abrams, an assistant secretary of state under Presidents Ronald Reagan and George W. Bush, will be a special envoy to Venezuela. Abrams is perhaps best known for pleading guilty in 1991 to charges related to the Iran-Contra affair, but was later pardoned by President George H.W. Bush. He said he relished the opportunity. "This crisis in Venezuela is deep and difficult and dangerous," he said, "and I can’t wait to get there." Officials at the embassy said the Maduro regime's threat to cut off gas and plumbing to the embassy was "a sick joke" since those are the conditions that many Venezuelans live with every day. "It’s a sick joke, because those are the conditions that many Venezuelans have to live in every day," he said. Perhaps sensing his slipping position, Maduro offered to meet with Guaidó, "whenever he wants, wherever he wants. If I have to climb [a mountain] at 3 a.m. to dialogue, I will do it." Meanwhile, the opposition has been working on its plan to oust Maduro. Guaido has been preparing to name a new board for Citgo, the Venezuelan owned energy company based in the US. Venezuela meanwhile has been threatening to cut off oil shipments to the US and default on the bond payments (that is, the bonds it hasn't already defaulted on). But with China and Russia digging in their heels and vowing to help support Maduro through this period of unrest, predictions that this could be the end of Maduro's regime, which has presided over an extreme economic crisis that has plunged the country into poverty, are probably still premature.